Indian prime minister Narendra Modi's decision to visit Jerusalem but not Ramallah has prompted much comment. 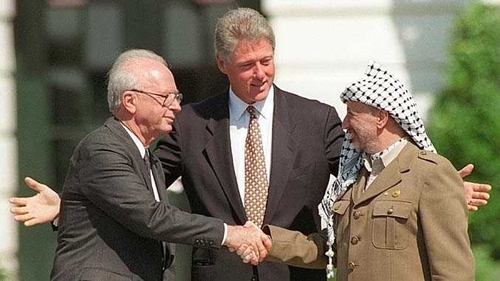 The expectation of equal treatment goes back to the Oslo Accords' signing in Sep. 1993, when the prime minister of Israel, Yitzhak Rabin, represented his government in the handshake with Yasir Arafat, the much-despised chairman of the Palestine Liberation Organization. No one found it strange or inappropriate at the time but things look differently nearly a quarter century later. It's now clear that Rabin's vanity got the better of him at that supremely high-profile event on the White House lawn. As the elected head of a democratic and sovereign government, he never should have consented to Arafat, the henchman of an unofficial, dictatorial, and murderous organization, enjoying equal status with himself. Rabin (L) looked reluctant but that did not make up for the mistake of allowing Arafat (R) to appear to be his equal. Rather, he should have stayed aloof. Appearing together as equals created a dysfunctional illusion of equivalence that over subsequent decades became assumed, ingrained, and unquestioned. In fact, this false equivalence became even more inaccurate with time, as Israel went from one success to another and the Palestinian Authority brought on a reign of ever-deeper anarchy, dependency, and repression. It's not just that Israelis stand among world leaders in science, technology, the humanities, and the arts, in military power and intelligence capabilities, not just that its economy is 25 times larger than the Palestinian one; in addition, Israel is ever more a land where the law rules for all (at one point recently, a disgraced president and a criminal prime minister were simultaneously sitting in prison) and individual rights are not just promised but delivered. Meanwhile, the head of the Palestinian Authority, presently in the 13th year of his 4-year term, has been neither able to prevent creeping anarchy on the West Bank nor a rogue group from taking over in Gaza, one-half of his putative domain. Some would defend Rabin's self-imposed humiliation by arguing that he sought to strengthen Arafat and the PLO through pomp and pageantry. If this was indeed the plan, it backfired spectacularly. Rather than use the prestige of the Oslo signing ceremony to build a constituency that accepted the Jewish state and thereby end the Palestinians' conflict with it, Arafat exploited his heightened standing to develop new resources to reject Zionism and attack Israel. Palestinian "embassies" popped up worldwide to delegitimize Israel, while Palestinians killed more Israelis in the five years after the Oslo signing than in the fifteen years before it. In other words, Rabin recklessly put faith in an historic and barbaric enemy changing not just tactics but goals. Israel has paid a heavy price for this error. Instead of the prime minister, the Israeli standing with Arafat on the White House lawn should have been someone like the second secretary at the Israeli embassy in Norway. That would have delivered the necessary signal that Arafat's protocol equivalent registers stoopingly low in the diplomatic hierarchy. 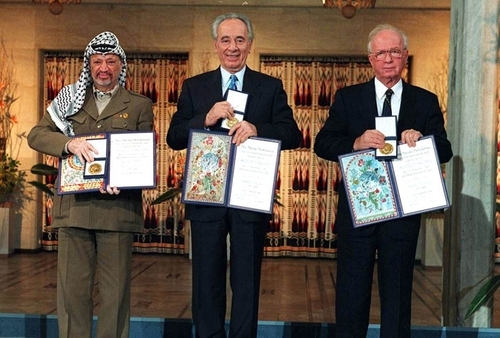 To be sure, that would have meant no Nobel Peace Prize for Yitzhak Rabin. In retrospect, however, would it not have been better to skip celebrating so exuberantly a flawed, doomed, and destructive agreement? Israeli leaders consenting to share a Nobel Peace Prize with Arafat was an even greater mistake than the original handshake. For good measure, the signing ceremony should have taken place in the modesty of Oslo, not the grandeur of Washington, the imperial capital, the home town of the only hyper-power. Had a lowly precedent been set in 1993, today's false parity between Binyamin Netanyahu and Mahmoud Abbas would not exist; the true imbalance of the Palestinian-Israeli relationship might be more clearly seen. As low-level diplomats, not prime ministers, negotiate with Arafat, Abbas, and the assorted other villains and self-styled Palestinian leaders, the world would be constantly reminded not of a sham parallel but of the vast moral and power gulf dividing the two sides. Well, that did not happen. But is it too late? Can Netanyahu or a future Israeli prime minister escape the indignity of meeting as equals with the leader of a gangster enterprise? No, it's not too late. Netanyahu could eloquently explain that he meets his legitimate counterparts; he will leave it to functionaries in the Foreign Ministry to handle whoever the Palestinian Authority throws up. Imagine the benefits of such a step: Israel would gain in stature while the fetid nature of the PA would be exposed. American presidents would lose interest in the "ultimate deal." Other assorted would-be mediators and do-gooders would have a much harder time trying to revive a quarter century of botched negotiations. So, I suggest Israeli prime ministers leave "peace-processing" with Palestinian hooligans to low-ranking staff. 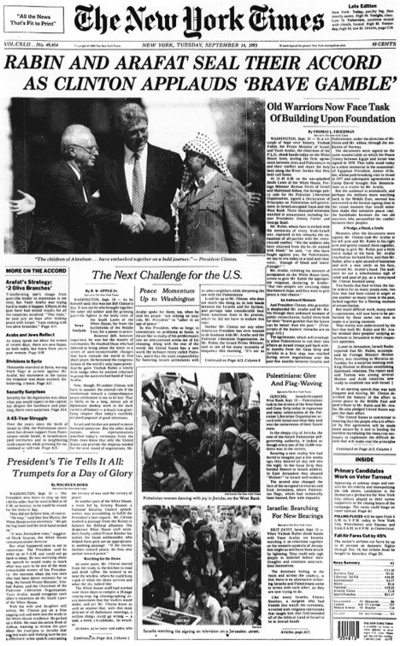 This New York Times front pages indicates how the Oslo Accord signing dominated the news. July 5, 2017 addendum: This insight came to me from studying Cypriot negotiations. Why, I asked myself when the talks resumed in February 2014, does the president of Cyprus consent to meet with the leader of a rebel district? July 8, 2017 update: Egypt's government seems to have heard my appeal. As reported by i24, Mahmoud Abbas "was received at Cairo airport on Saturday by just Egypt's Electricity Minister and other more junior officials." July 21, 2017 update: Britain's Prime Minister Theresa May will no longer meet with Scotland's First Minister Nicola Sturgeon but instead refer her to Scottish Secretary David Mundell who is on the "same level as her." Which two specific individuals would sign the agreement on behalf of Israel and the PLO? Initially, the thought was that neither Israel nor the United States were yet ready to see Arafat himself travel to the United States and sign the agreement in front of the entire world media. Indeed, for decades U.S. officials had been prohibited by law from negotiating with the PLO, and Arafat specifically barred from entering the United States. To allow an official PLO representative other than Arafat to travel to Washington was already a quantum leap, and in Israel, needless to say, there was little appetite for anyone to be seen together with Arafat in a photo. The initial Israeli decision was that Peres would sign the agreement on behalf of Israel, and Rabin and Peres expected the PLO to designate Mahmoud Abbas (commonly known by his nickname Abu Mazen), the PLO official who oversaw the Oslo negotiations, as its representative. Under this plan, neither Arafat nor Rabin would come to Washington. This would have allowed Rabin to project an image that closely tracked with his true personal feelings regarding Oslo, as someone who only grudgingly embraced the agreement. He wanted to be seen as a statesman who responsibly endorsed the agreement that he believed best served Israel's interests but, both as a politician and a private person, he could not bring himself to stand close to anyone belonging to a notorious terrorist organization that had murdered hundreds of innocent Israelis. So even though President Clinton indicated to Prime Minister Rabin that Arafat wanted to come to Washington and sign the Oslo Agreement in person and further that President Clinton would want to see Prime Minister Rabin do the same, when Rabin responded that he did not intend to come, President Clinton, a bit reluctantly, accepted that neither Rabin nor Arafat would show up. But then, just two days before the signing ceremony, Rabin had a critical change of heart. Two of Rabin's aides convinced him that he could not afford to be absent from the historic event formalizing the culmination of the process that he had adopted, shepherded to a successful conclusion, and would continue to lead in the years to come. Once Rabin changed his mind and informed President Clinton that he was coming to Washington, it became impossible to exclude Arafat. The Rubicon had been crossed. Comment: Singer confirms that egoism drove Rabin's decision to go to Washington.